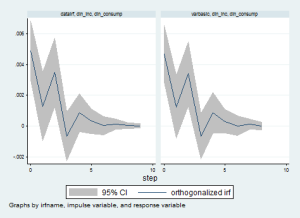 Let’s learn how to model time series data using some simple commands and tricks on Stata! Hey Guys! What’s up? It’s been a while since my last post.. But now I am here to maintain the promise I made you. The hot topic will be how to model AR(), MA(), ARIMA and ARMAX(). As usual, I suggest you to check the theory behind the commands before we start. We are clearly dealing with a non-stationary time series with an upward trend so, if we want to implement a simple AR(1) model we know that we have to perform it on first-differenced series to obtain some sort of stationarity, as seen here. I estimated an AR(1) model on the differenced series that seems not to be the “best” choice, considering that errors are serially correlated. Then I performed an AR(2) model that behaves better. 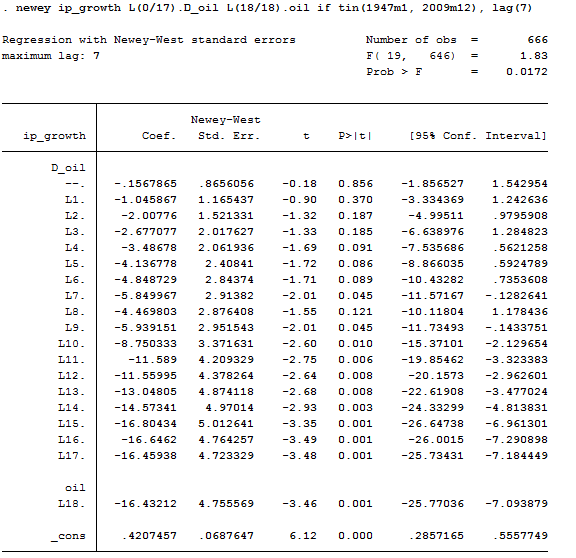 L(1/2) means that Stata has to regress the first difference of gnp96 on its first and second lags. We can reject the null hypothesis that the coefficients are equal to zero jointly. Another useful option when you play manually with time series is the if tin(.) that restricts the sample to times in the specified range of dates, in this case from 1970 first quarter through 1990 fourth quarter. If you don’t remember when we used these data, you are kindly invited to check it here. Regress the monthly change in the short rates rs (Bank’s of England’s monetary policy instrument) as a function of the prior month’s change in the long-term rate r20, assuming that the error term times each right-hand-side variable is autocorrelated for up to # periods of time. (If # is 0, this is the same as regression with robust standard errors.) A rule of thumb is to choose # = 0.75 * T^(1/3), rounded to an integer, where T is the number of observations used in the regression. If there is strong serial correlation, # might be made more than this rule of thumb suggests, while if there is little serial correlation, # might be made less than this rule of thumb suggests. Stata created a useful command that computes every model automatically; you just need to know its components to use it at it best. 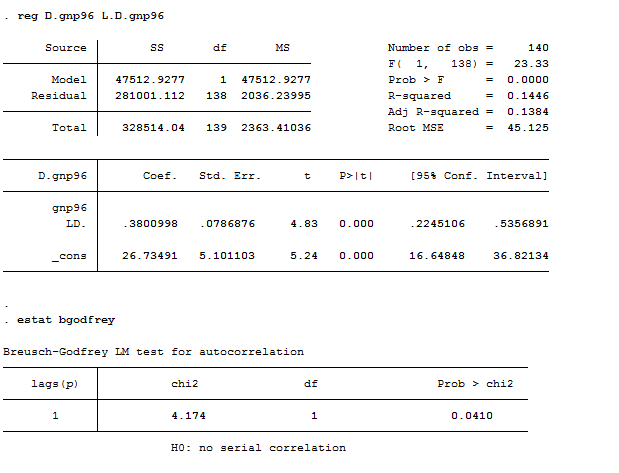 Stata’s capabilities to estimate ARIMA or ‘Box–Jenkins’ models are thus implemented by the arima() command. These modeling tools include both the traditional ARIMA(p, d, q) framework as well as multiplicative seasonal ARIMA components for a univariate time series model. The arima command also implements ARMAX models: that is, regression equations with ARMA errors. In both the ARIMA and ARMAX contexts, the arima command implements dynamic forecasts, where successive forecasts are based on their own predecessors, rather than being one-step-ahead (static) forecasts. Let’s play! 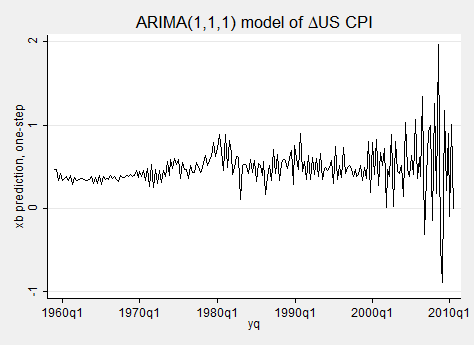 I will use directly ARMAX models to show you a bit of regressions. The estimation sample runs through 1994m12. Several prediction options are available after estimating an arima model. The default option, xb, predicts the actual dependent variable: so if D.cpi is the dependent variable, predictions are made for that variable. 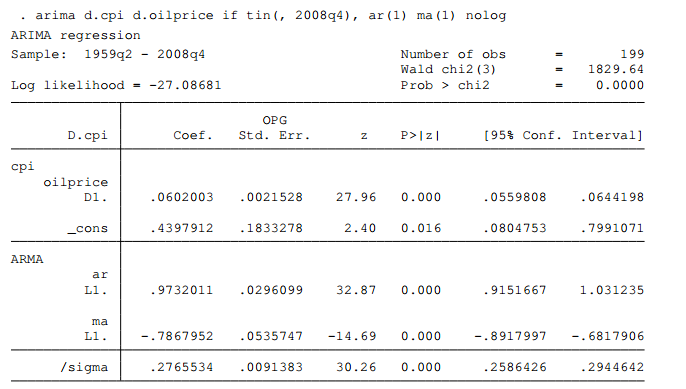 In contrast, the y option generates predictions of the original variable, in this case cpi. The mse option calculates the mean squared error of predictions, while yresiduals are computed in terms of the original variable. 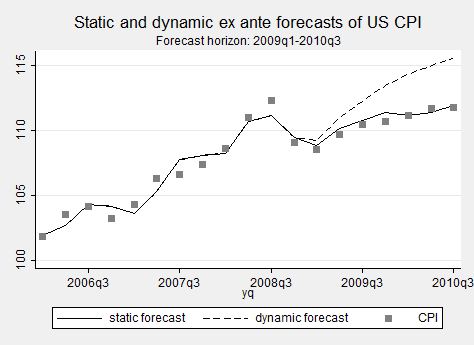 We can now use these data to compute static (one-period-ahead) ex ante forecasts and dynamic (multi-period-ahead) ex ante forecasts for 2009q1–2010q3. In specifying the dynamic forecast, the dynamic( ) option indicates the period in which references to y should first evaluate to the prediction of the model rather than historical values. In all prior periods, references to y are to the actual data. Once you can plot something like that you start feeling powerful. That’s the beauty of STATA! irf // Extremely importan ( I am not running into it today) It creates and analyzes Impulse Response Functions. Here, the growth rate of industrial production (ipgrowth) is related to the percentage oil price increase or 0 if there was no oil price increase (oilshock) in 18 previous months. This provides estimates of the effects of oil price shocks after 1 month, after 2 months, etc. 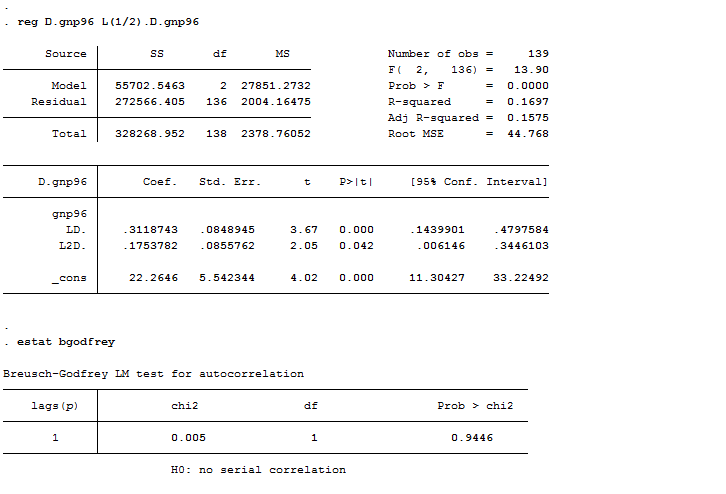 Confidence intervals and p-values are reported along with these results. You could draw by hand a graph of the estimated effects versus the time lag, along with 95% confidence intervals. You could also draw by hand a graph of the estimated cumulative effects versus the time lag, along with 95% confidence intervals. 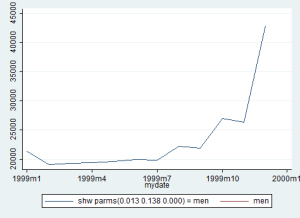 Making the same graphs in an automated fashion in Stata is a little more painstaking. Ok guys. Let’s stop there for now. Soon we will go through multivariate models!